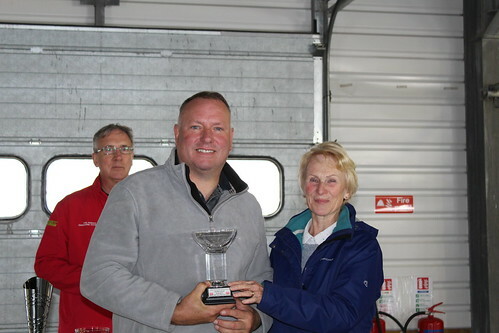 Our final visit ever to the Rockingham Motor Speedway took place on 15th and 16th September 2018. 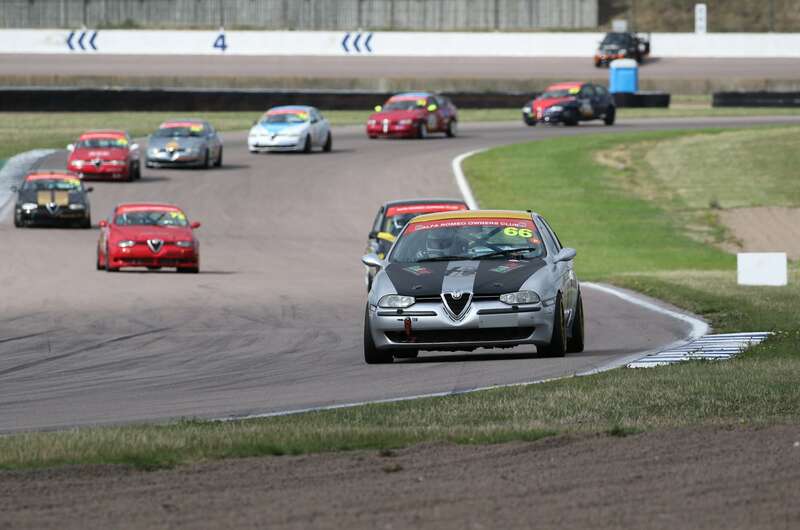 It is sad to say, but true, that it has not been a particularly popular circuit with those racing Alfas (and some other championships) and we have struggled for grid numbers there in recent years. This year was a case in point, with a slim field of 12 entries: 3 Power Trophy cars and 9 Twin Sparks. 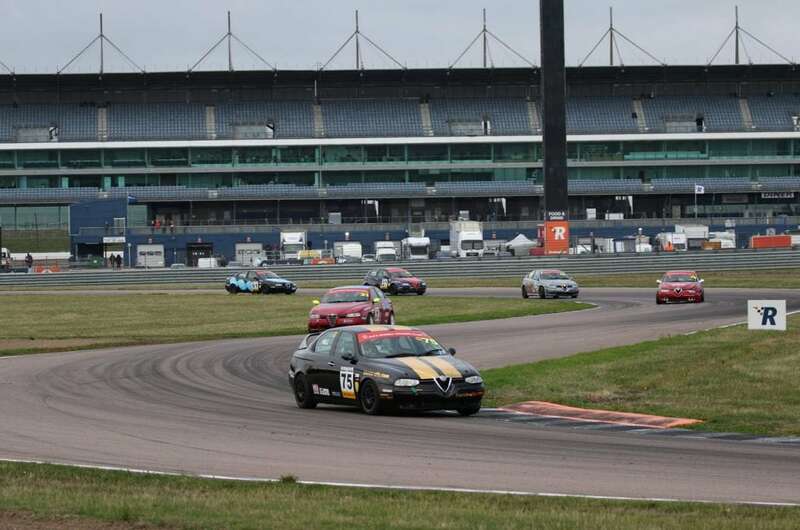 Nevertheless, there was much at stake in terms of Championship positions and what the entry lacked in overall numbers it certainly did not lack in competitiveness. 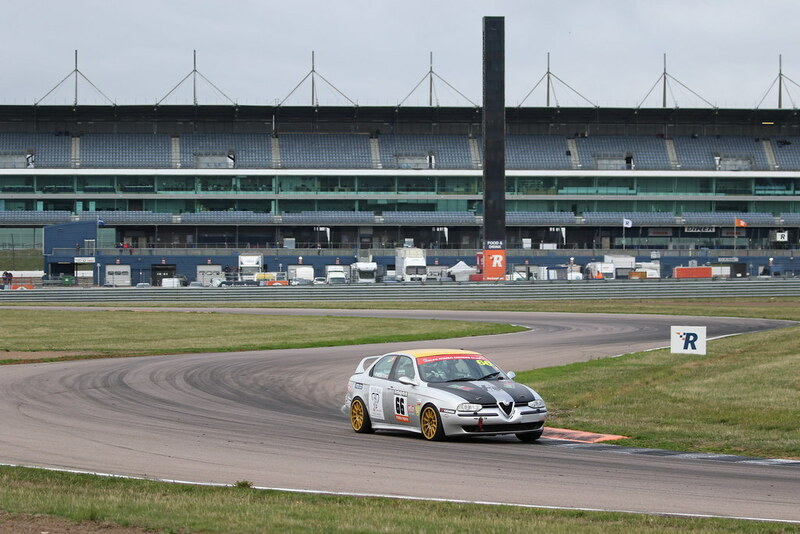 The Friday test day proved to be a busy day for Bianco: Kristian Leith’s car had clutch problems and a failed gearbox mounting and Riccardo Losselli’s had a sensor failure which led to him missing most of the day as the team sought a replacement from Eurospares. Most of the drivers also opted to do the Saturday morning practice session to get the feel of the circuit and the conditions. There had been heavy rain overnight but a bright sunny morning and a drying wind put paid to the residual moisture and the conditions for racing were excellent. A feature of qualifying was that the vast majority of the quickest times were set in the first 5 laps. 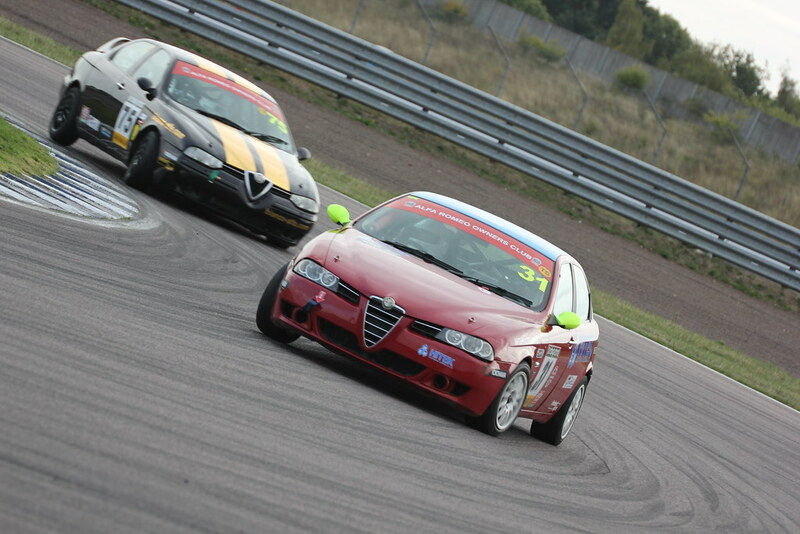 The reason seemed to be that the abrasive Rockingham surface caused the tyres to lose their edge after only a handful of laps so, with rare exceptions, it was important to be on the pace straight away. 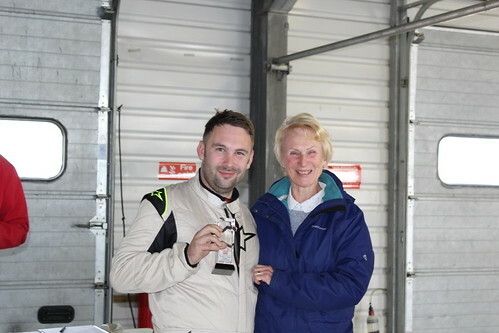 Tom Hill was first out on the circuit as usual and his fastest time of 1:48.353 – which was to be the Twin Spark pole – was set on his first flying lap, and indeed his best 3 times were set on his first 3 laps. 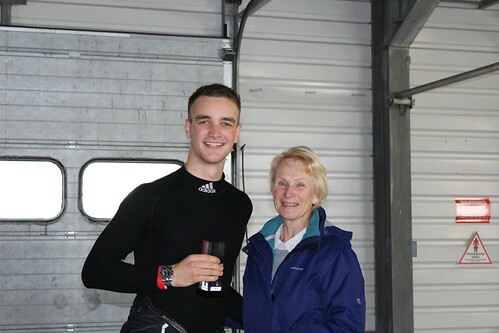 3/10ths behind Tom was Kristian Leith, with a lap of 1:48.670, again set early in the session – on his 4th lap. Kristian is undoubtedly a quick driver, and consistency is often a feature of his qualifying sessions, as evidenced here with only 1.6s between the slowest and the fastest of his 11 qualifying laps. 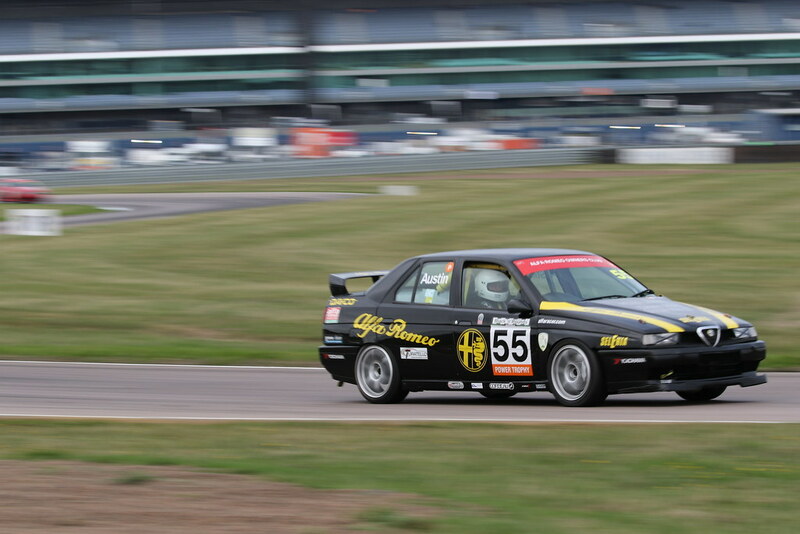 Richard Ford was the 3rd quickest Twin Spark, which was extraordinary. Why? Because he had never raced at Rockingham before nor had he participated in Friday testing or the Saturday morning practice session. So, completely new to the circuit, he posted a 1:49.005 on only his 3rd flying lap to line up on the inside of the Twin Spark second row. 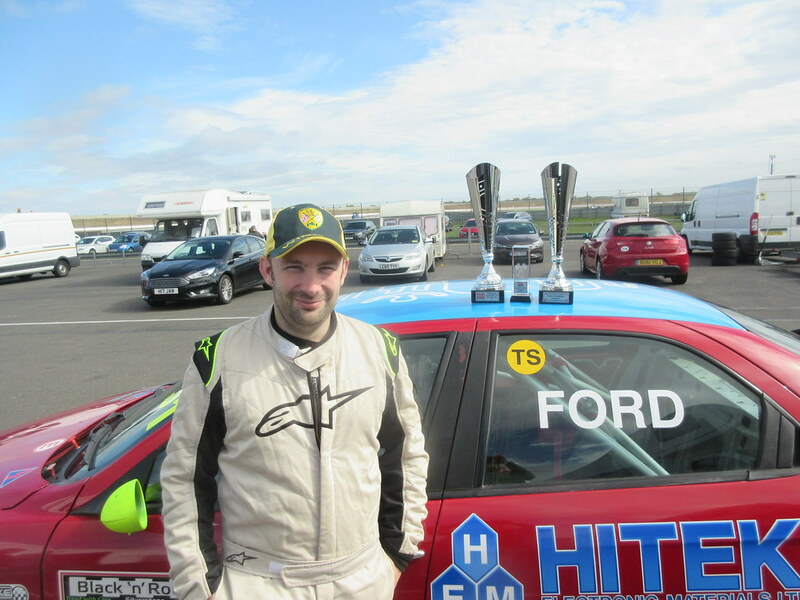 Fourth quickest Twin Spark was the ever-competitive Dave Messenger with a 1:49.028 on his 2nd flying lap. Andy Hancock, making a welcome return to the Championship, albeit probably for the last time, was 5th with a 1:49.160 – again on his 2nd flying lap – and Andy was intent on signing off with a signature performance. Ricky Losselli was next, back in his usual 147 after a couple of outings in Andy Hancock’s 156, and he would line up 6th quickest with a lap of 1:49.874. Comparing the respective performances of the 147 and 156 he found them comparable overall – although each had an advantage in particular parts of the circuits, the result was an equivalency of lap times. Mel Freeman was 7th and unusually her best lap was her final one, a 1:50.352. 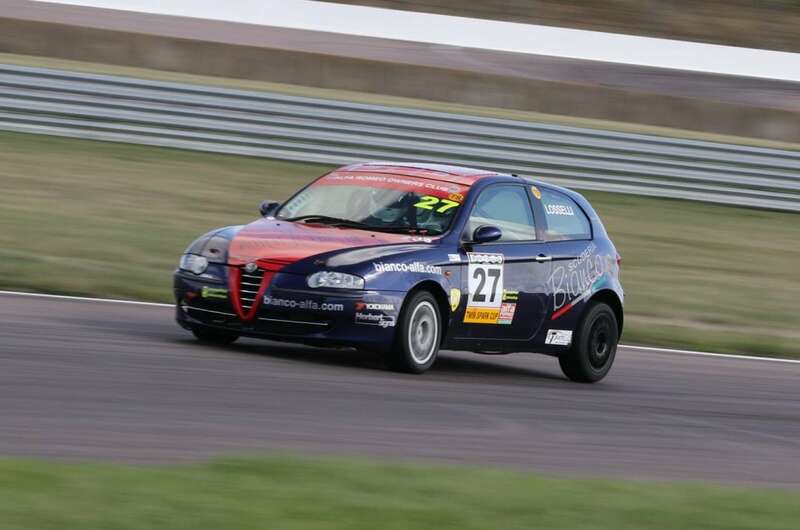 With new suspension on the car she was pleased with the improvement in the car’s handling, finding it significantly more driveable than before, and she was hoping to demonstrate an improvement in her race pace. Andy Inman recorded some respectable early lap times but then was sidelined by electrical problems. In the pit garage after the session the car was surrounded by those trying to cure the problem but unfortunately to no avail. The car’s wiring has always looked over complicated but it has always run reliably. Not today – sadly Andy would be a non starter. 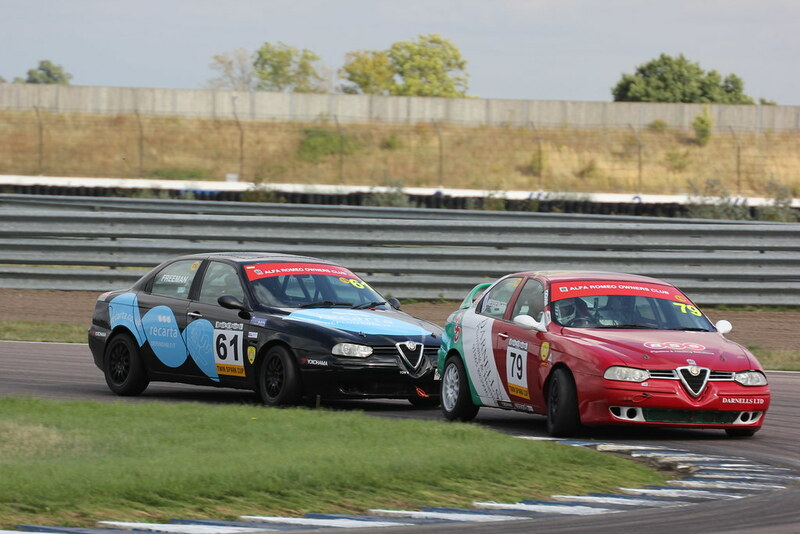 Finally, Avni Ropica’s car was also in difficulties. 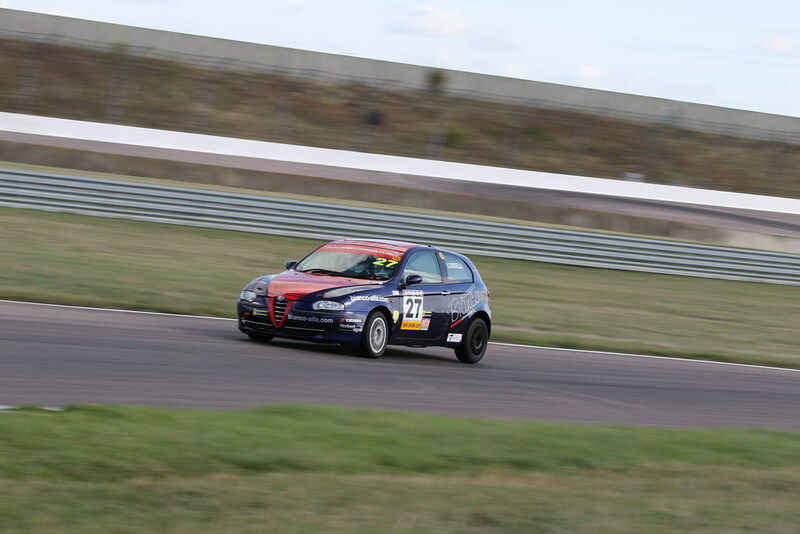 Somewhere on the circuit it seemed that his gearbox had made contact with a kerb, knocking it upwards into the oil filter and causing a major oil leak. He was only able to complete 5 laps and would start right at the back of the field. Meanwhile, what of the 3 Power Trophy runners? 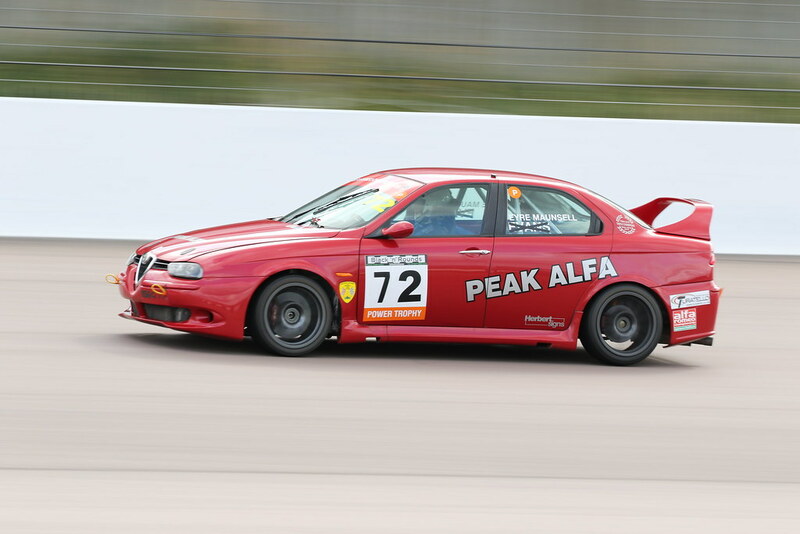 The combatants were Paul Webster in his 3.2 litre 156 GTA, Scott Austin in his 3.0 litre 155, and the evergreen Robin Eyre-Maunsell in the Peak Alfa-prepared 156 GTA. At the outset Paul was concerned about a dyno test that showed his engine was struggling to produce 185 BHP as against the rolling road report at the start of the season which showed 240 BHP or thereabouts. He felt he was there just to pick up whatever points he could in the light of these engine problems. The results did not validate his anxiety! 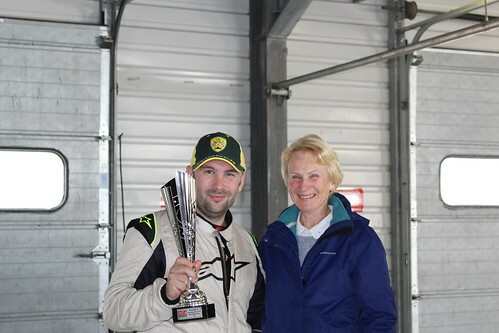 In the early laps he was a second or so quicker per lap than both his rivals and – unusually in the context of this particular qualifying session – he set his fastest lap of 1:44.852 on his 11th and final lap, 1.8 seconds clear of Scott Austin who was second quickest. Scott’s best lap of 1:46.645 was set early in the session, and he felt the car was in good shape, though unable to get close to Paul’s times. Robin’s best time of 1:46.797 was only 1/10th shy of Scott but his overall lap times varied by around 5 seconds per lap and he was struggling to set consistent times. He was certainly unimpressed with his times, brow furrowed with frustration. 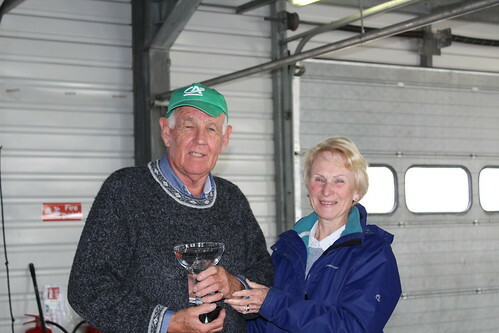 After the prize giving at Rockingham, Robin spoke to me. He was dissatisfied with his performance over the weekend and this had made his mind up – he was going to retire. He felt that age had caught up with him. Having driven rear wheel drive cars for virtually his entire career, he was struggling to get the front wheel drive GTA through the corners effectively and to get the power down on the exits. 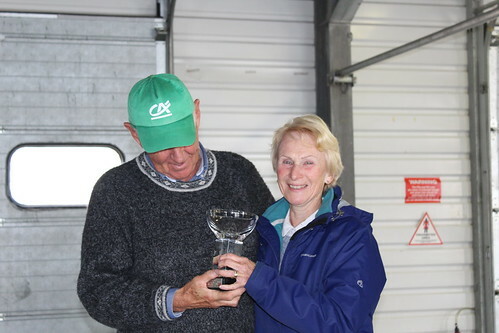 He thought he would still have a go at some historic racing but no more ultra competitive stuff! ‘A character straight out of a P.G. Wodehouse story…’ (If anyone reading this hasn’t read a P.G. Wodehouse story I urge you to go and read one!) 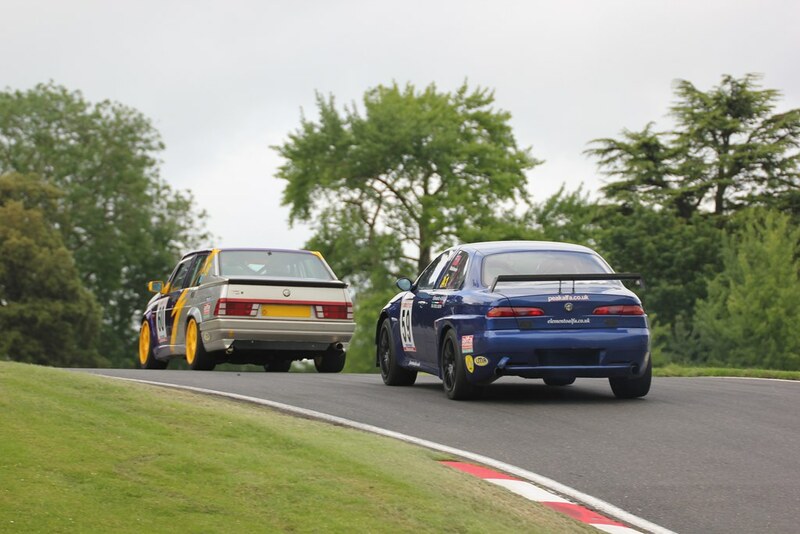 A few years ago – before the days of split grids – I got a terrible start at Cadwell in my modified 156 and got swallowed up by Twin Sparks. I picked my way through them carefully, got clear and set about trying to catch the other 3 modified runners ahead. It seemed a hopeless chase as I had lost too much ground but on the last lap I came round the Gooseneck and over the brow before the descent to Mansfield and there was Robin in his 75 – sideways to the left, then sideways to the right, then sideways to the left again. Momentarily I paused – what on earth is he doing I wondered? – before gathering my thoughts and nipping through the middle of all his half-spins and nicking 3rd place off him. Crackers! What an extraordinary character Robin is – drink a toast to the man! 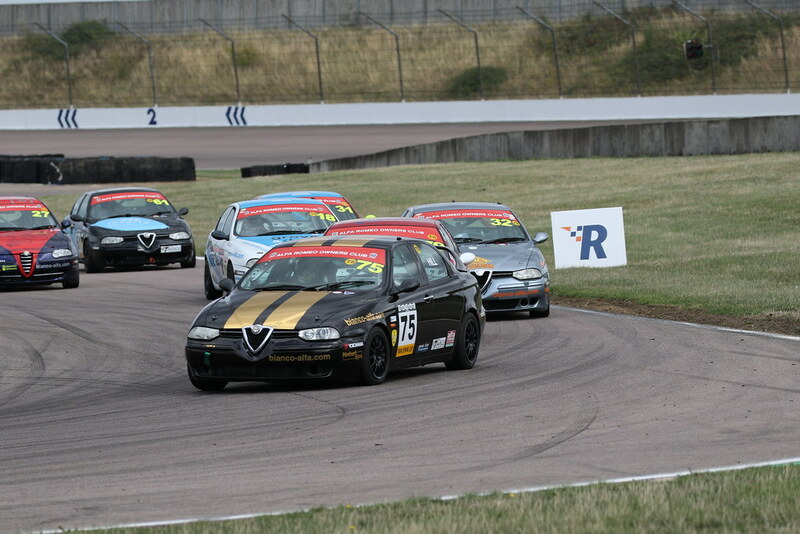 With a disappointed Andy Inman unable to start, 11 cars took to the grid for Race 1. However, Avni Ropica came in to the pits at the end of the green flag lap with drive shaft failure and that left us with 10. With only 3 Power Trophy runners it was a unified grid – all starting on the lights – but we retained the 3-row gap to the Twin Sparks for safety reasons. This was just as well as Robin Eyre-Maunsell was slow away until, with Twin Sparks swarming around him, he found the right gear and pulled clear – just. Paul Webster had got away well, followed by Scott Austin and Robin. 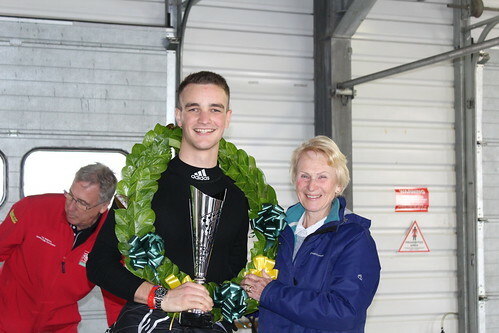 Tom Hill got an excellent start from the Twin Spark pole position and put in an opening lap 3 seconds quicker than any of his rivals to stamp his authority on the race from the outset. Behind him it was extremely close at the hairpin with Dave Messenger just ahead of Kristian Leith, Andy Hancock and Richard Ford and the rest right behind. 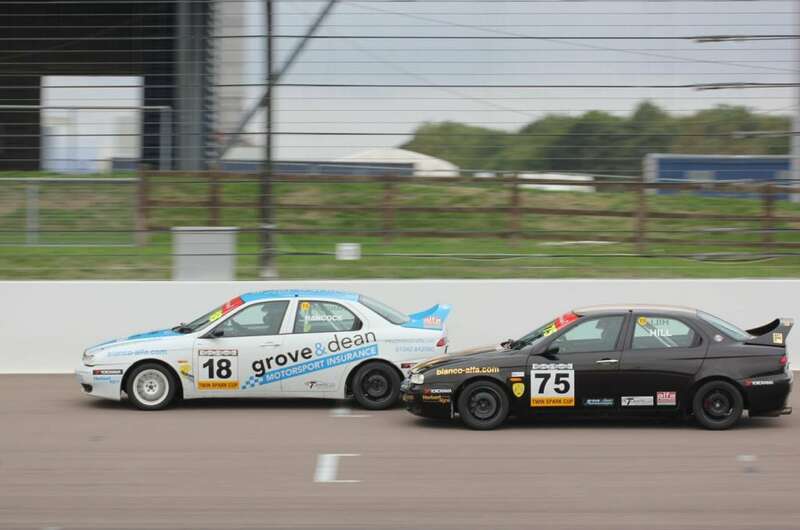 As the cars approached the end of lap one, Dave and Kristian were side by side through the Brook chicane, both ran wide on the return to the oval at turn 4, allowing Andy and Richard to move ahead of them. At the end of the lap Andy was in 2nd place, with Richard and Kristian in close order behind. Dave Messenger had dropped to 5th with Ricky Losselli and Mel Freeman just behind him. On lap 2 Ricky passed Dave, but over the next 9 laps the Twin Spark order remained unchanged, with Tom holding the gap to Andy at the front to around 4 seconds and Dave Messenger and Mel Freeman locked in an entertaining dice at the rear of the field. Suddenly, on lap 11, things changed: Richard Ford had a good exit at turn 4 on to the start finish straight and moved into second place by turn one. By the end of the lap Kristian Leith had also passed Andy to go into 3rd, positions which they held to the flag from Andy and Ricky. 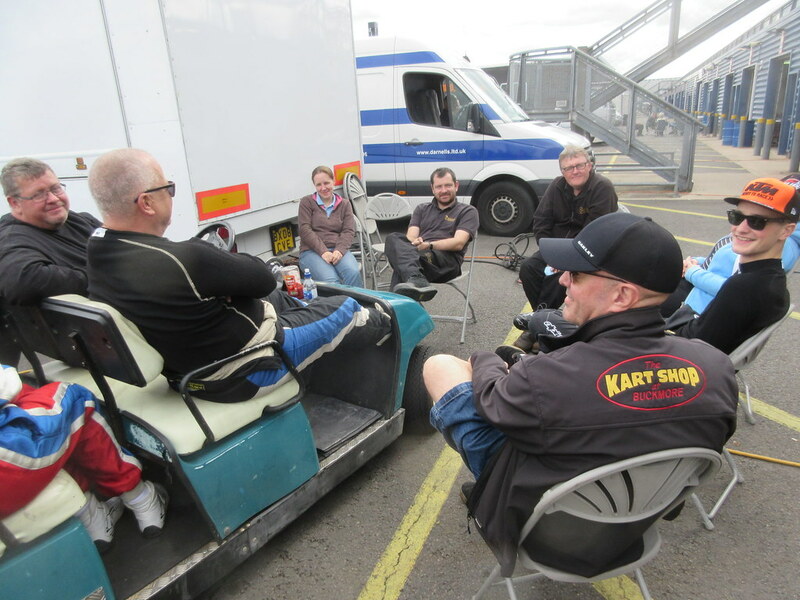 The final pair continued to dice – Mel got through at one stage exiting the chicane but then ran wide on the next lap and Dave got ahead again. At the flag Dave held the place by only 1/10th, Mel only a metre or so behind at the line. Meanwhile the 3 Power Trophy runners had got very spaced out, with Paul Webster leading Scott Austin and Robin Eyre-Maunsell in that order. Paul was drawing away from Scott at an average of around 2s per lap and by the end of lap 6 the gap was 14 seconds. Scott in turn was some 6 seconds ahead of Robin but then had a slithery moment exiting Tarzan and decided to back off a little, not having any realistic chance of catching Paul. A couple of laps later, however, he looked in his mirrors and saw Robin much closer so put his foot down again and re-established a 10 second gap. 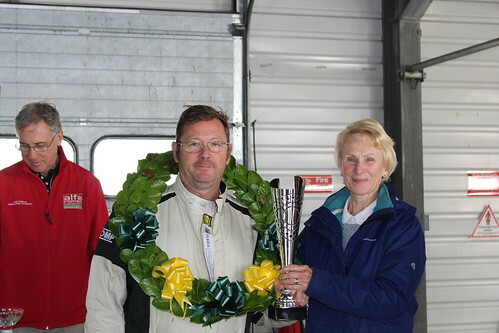 Paul won by 28 seconds in the end with Scott 2nd and Robin 3rd. Sunday morning was cooler than the day before with a strong chilly breeze blowing when the cars took to the track for a 10.28 start. 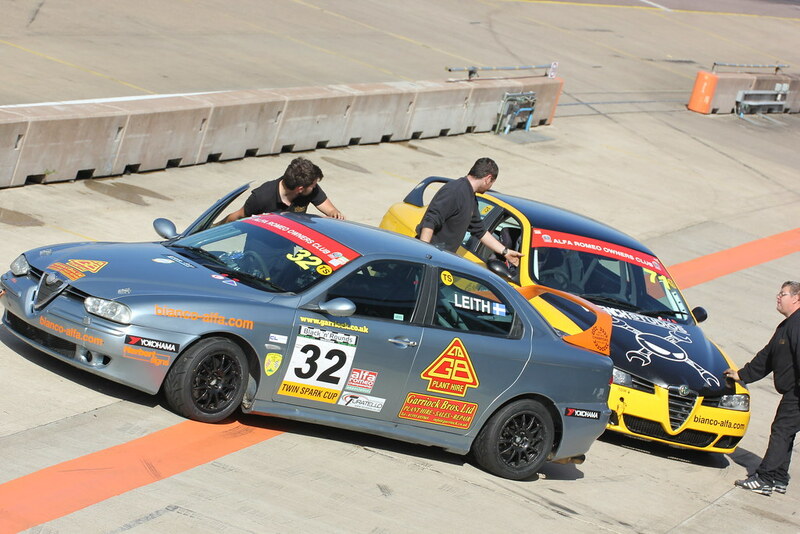 Avni Ropica’s car had the drive shaft problem sorted out and he lined up at the back of the 11-car field. When the lights went out Andy Hancock made a great start from the second row of the Twin Spark grid, going through the gap between Tom Hill and Richard Ford as they went through the left hander on the banking and taking the lead. 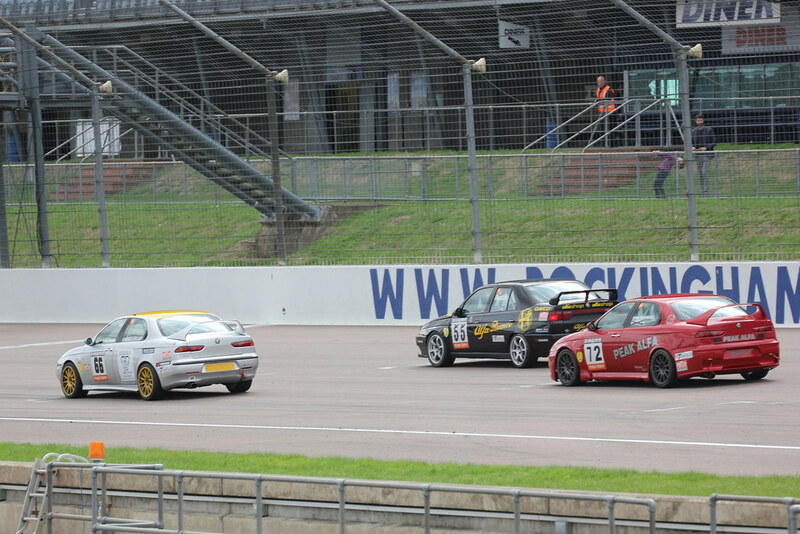 The Power Trophy runners had got away in grid order with Paul Webster steadily building a lead over Scott Austin. 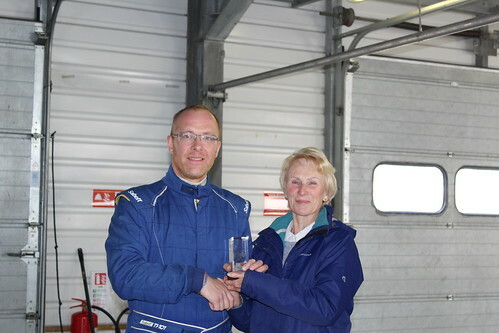 Robin Eyre-Maunsell was 3rd but was clearly struggling in the twistier parts of the infield circuit. He would pull ahead going down the start/finish straight but by the time they got to Tarzan he was engulfed by Twin Sparks and Tom Hill actually got past him on lap 3 at the Deene hairpin and led through Pif Paf and the Rockingham Curve before Robin powered back ahead along Steel Straight, before settling down and maintaining a 1-2 second gap thereafter. At the finish Paul won by 37 seconds from Scott, with Robin a further 3 seconds back. Sadly for Andy Hancock, his initial Twin Spark lead didn’t last: Tom Hill got back in front going down the inside of him at the hairpin at the end of the banking on lap 2 and at the end of that lap the running order was Tom from Andy, then Dave Messenger, Kristian Leith, Richard Ford, Ricky Losselli, Mel Freeman and Avni Ropica. On lap 3 Mel passed Ricky to cheers from her supporters (and groans from Riccardo’s), and on lap 4 Richard Ford passed Kristian Leith – Richard was starting to show the signs of producing one of his superlative drives from midfield to the front of the running order which gathered further momentum when he passed Dave Messenger at the Deene hairpin on lap 5. Also on lap 5, Andy Hancock was clearly experiencing mechanical difficulties, spinning at the chicane and dropping to last place before pitting, never to rejoin. This was clearly an unhappy end for a popular driver and former sponsor of the Championship who was now retiring from the Championship – Andy, I hope the disappointment has been temporary and I’m sure all of us wish you every success in your future endeavours. On the same lap, Avni Ropica retired. He had been circulating in last place, unable to mount a concerted challenge on those ahead and was clearly frustrated with the car. However, motor racing is like most sports; its failures spur one on to do better things in future and I have no doubt that Avni will be back on the pace very soon – these setbacks are certainly character building, as I know from experience, and things will certainly come good in time for him. Over the next few laps Richard Ford’s inexorable progress continued. 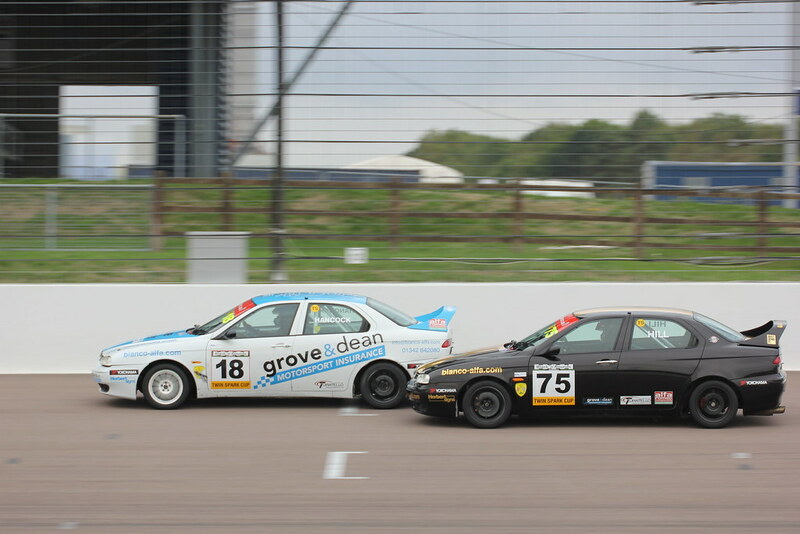 He closed the gap to Tom and on lap 8 the unexpected happened: Richard had moved ahead of Tom into the Deene hairpin and was through into the class lead, this being the first time this year that Tom had been passed on the track other than at the start or as a result of an incident or mechanical problem. It was well earned and was well deserved. 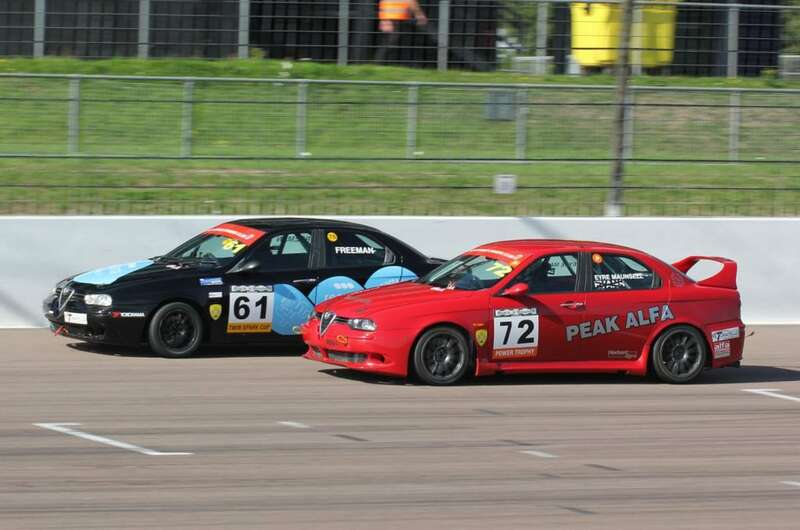 The gap to Tom increased to – and remained at – around 4 seconds to the end. 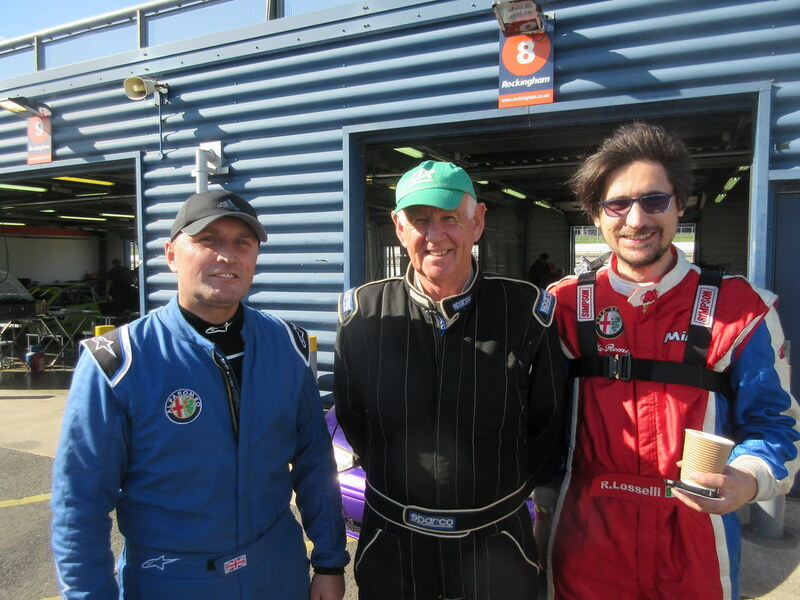 Kristian Leith had driven assertively to wrest 3rd place away from Dave Messenger, who now only had Mel Freeman and Ricky Losselli behind him. Ricky was ahead but on the last lap Mel got past Ricky – ‘she was very fair’ he said. 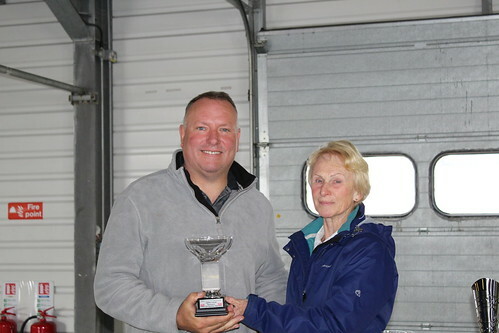 Paul Webster’s fastest lap time of 1:44.625 was a new Power Trophy lap record for the history books. 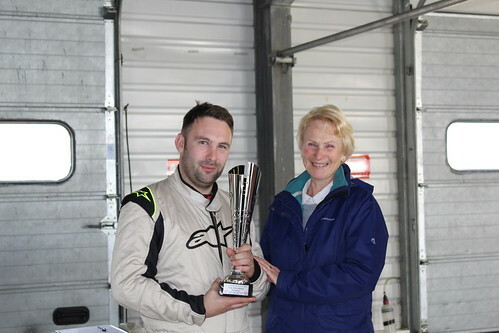 Richard Ford’s fastest lap time of 1:48.248 was fastest of the weekend but not enough to eclipse Tom Hill’s twin spark lap record of 1:48.080. 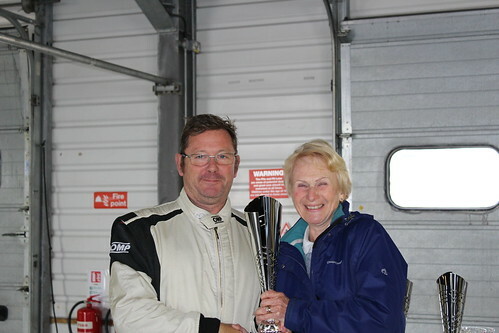 Barry McMahon’s overall lap record of 1:36.206 remains. 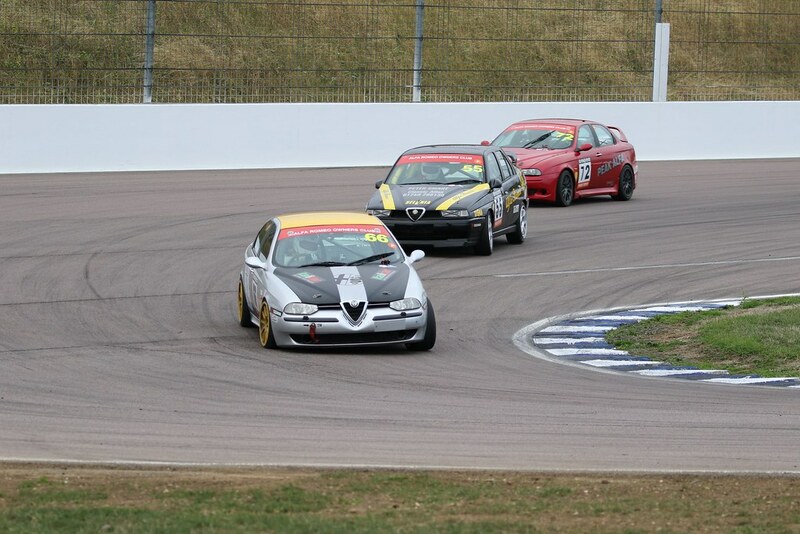 Thus endeth the final ever Alfa Romeo Championship race at the Rockingham Circuit. 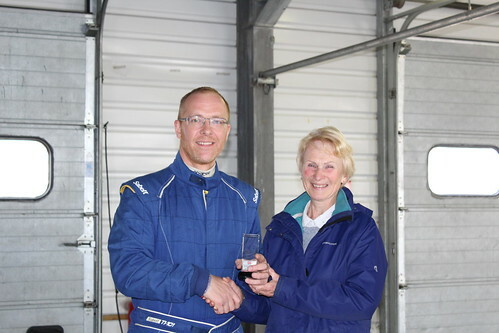 Richard Ford was worthy of his Driver of the Weekend award particularly as he had never practised or tested at the circuit before achieving his win and second place in the Twin Spark class. 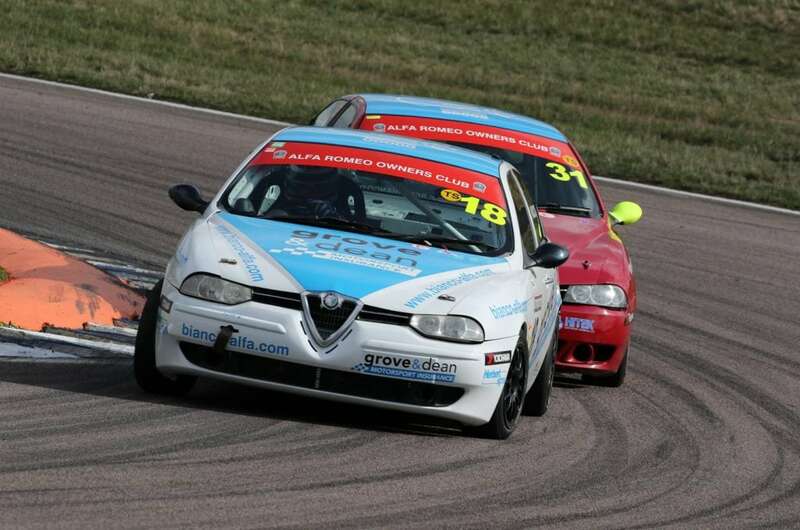 Now it’s onward to Oulton Park for the season’s finale – bring it on!